The significance of tumor angiogenesis has been recognized for many centuries. However, it was not until the 1970s, when Brem et al. (1) aroused interest in pathological angiogenesis, that the first attempt was made to generate a systematic method for quantifying angiogenesis. It has been only in the last 10 yr, with the advent of highly specific endothelial markers (2,3) which can be used in histological archival tissues, that quantitation studies have been performed. The majority of studies on quantifying tumor angiogenesis have followed the method of Weidner et al. (4) and used antiendothelial cell antibodies and a variety of immunohistochemical techniques to highlight the tumor vasculature. Briefly, the three areas containing the maximum number of discrete microvessels are identified by scanning the tumor at low power. Individual microvessels are then counted on high power objectives. Any immunoreactive endothelial cell(s) that is separate from adjacent microvessels is considered a countable vessel. Vascular lumina are not a requirement to be included in the count, and the vessels within any central sclerotic area of the tumor are not included. Most of these studies have shown that an increased microvessel density as a measure of angiogenesis is a powerful prognostic tool in many human tumor types (see Sections 4. and 5.). 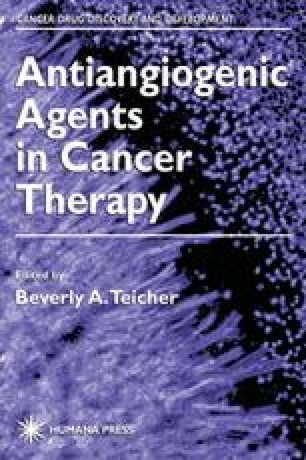 Nevertheless, despite the initial confirmatory publications, numerous reports are now appearing in the literature that fail to show a positive association between increasing tumor vascularity and reduced patient outcome, and caution as to the clinical utility of tumor angiogenesis is being urged (5). However, many of these negative studies may result from significant differences in methodologies. There are several major considerations to take into account when quan tifying tumor angiogenesis in histological sections using immunohistochemistry. These include the method used to identify the tumor vasculature, the representative tumor area measured, the vascular parameter and the counting technique selected, and the cutoff used in the statistical analysis to derive the method.